(Top) A French Dassault Rafale of squadron 2/92 "Aquitaine" refuels from a KC-135 Stratotanker over Africa on Mars 17, 2013. Operation Serval (French language: Opération Serval) is an ongoing French military operation in Mali. The aim of the operation is to oust Islamic militants in the north of Mali, who had begun a push into the center of Mali. Operation Serval follows the UN Security Council Resolution 2085 of 20 December 2012. In January 2012, following an influx of weapons that occurred after the Libyan civil war, Tuareg tribesmen of the National Movement for the Liberation of Azawad (MNLA) began a rebellion against Mali's central government. In April, the MNLA said it had accomplished its goals and called off its offensive against the government, proclaiming the independence of Azawad. In June 2012, however, the MNLA came into conflict with the Islamist groups Ansar Dine and the Movement for Oneness and Jihad in West Africa after the Islamists began imposing Sharia in Azawad. By 17 July, MOJWA and Ansar Dine had pushed the MNLA out of all the major cities. On 1 September 2012, the town of Douentza, in the Mopti Region, until then controlled by the Ganda Iso militia, was taken by the MOJWA, and on 28 November 2012, the MNLA was pushed out of Léré, Timbuktu Region, by Ansar Dine. Initially the French Air Force deployed two Mirage F1 CR Reconnaissance from the 2/33 Savoie Reconnaissance Squadron and six Mirage 2000D fighter jets, which were already part of the French military Opération Épervier in Chad. Additionally the Air Force deployed three KC-135 Stratotanker planes, as well as one C-130 Hercules and one Transall C-160 transport planes from the French airbase in N'Djamena. 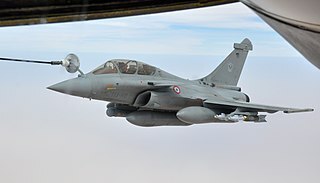 On 13 January four Rafale fighter jets of the 1/7 Provence Fighter Squadron flew from the Saint-Dizier Airbase in France to attack targets in the city of Gao. The Rafale planes then proceeded to N'Djamena and are to remain based there for the duration of the conflict. By 16 January the French Air Force dispatched two additional KC-135 Stratotanker planes and two Harfang UAVs from the 1/33 Belfort Reconnaissance Squadron to N'Djamena. To transport Army troops to Bamako the Air Force used the Airbus A310 and A340 of the 3/60 Estérel Transport Squadron. On 23 January a detachment of Fusiliers Commandos de l'Air was deployed to the airport in Bamako to provide security for the French Air Force assets stationed there and to execute combat search and rescue missions if necessary. Along with the Fusiliers the Air Force deployed two Puma helicopters of the 1/67 Pyrénées Helicopter Squadron in the combat search and rescue role to Bamako. On 25 January the Air Force deployed two additional Rafale fighter jets and two additional KC-135 Stratotanker planes to N'Djamena, bringing the total to six Rafale jets and 5 KC-135's in the theater of operations. Transall C-160 transport planes from the 1/64 Béarn and 2/64 Anjou squadrons and C-130H Hercules transport planes from the 2/61 Franche Comté squadrons were used to ferry materiel to Bamako, while Transall C-160 transport planes from the 3/61 Poitou Transport Squadron flew reinforcements to the airport of Gao. French Army forces deployed include one company of the 21st Marine Infantry Regiment, an Armored Cavalry platoon of the 1st Foreign Cavalry Regiment and one company of the 2nd Marine Infantry Regiment. On 14 January, the French Army Light Aviation transported Eurocopter Tiger HAP attack helicopters from the 5e Régiment d'Hélicoptères de Combat to Mali. Furthermore a company from the 3rd Marine Infantry Parachute Regiment and soldiers from the 1st Parachute Hussar Regiment and the 17th Parachute Engineer Regiment, which are all currently deployed as part of Operation Unicorn in Ivory Coast left Abidjan in a convoy of 60 vehicles for the Malian capital of Bamako. The Commander of the French Land Forces general Bertrand Clément-Bollée announced that a company of the 92nd Infantry Regiment equipped with VBCI Infantry fighting vehicles has been sent to Mali. An additional three companies equipped with VBCI and one squadron equipped with Leclerc main battle tanks could be sent on short notice if required. An armored company of the Marine Infantry Tank Regiment is being deployed to Mali as are CAESAR self-propelled howitzers. On 21 January a company of the 3rd Marine Infantry Regiment arrived in Bamako to provide security for the allied airhead. Ground operations are commanded by Brigadier General Bernard Barrera, commanding officer of the 3rd Mechanized Brigade. 11e Régiment d'Artillerie de Marine (11e RAMa), one battery with TRF1 155mm howitzers and MO-120-RT-61 120mm mortars. The Mistral class "Dixmude", a amphibious assault ship and helicopter carrier from the French Navy. The French Navy deployed five Breguet Atlantic long-range reconnaissance aircraft operating from Dakar in Senegal and transported two companies of the 92nd Infantry Regiment along with their equipment and military materiel on the Mistral class amphibious assault ship Dixmude from Toulon to Dakar in Senegal. The Dixmude was escorted on her journey by the D'Estienne d'Orves class corvette LV Le Hénaff. These are the forces committed by the countries that support France (in alphabetical order). Chad: On 16 January the Chadian government announced that it will deploy 2,000 troops: one infantry regiment with 1,200 soldiers and two support battalions with 800 soldiers. The Chadian forces will not be part of the African-led International Support Mission to Mali but will be integrated into the French command structure. Denmark: A Royal Danish Air Force C-130J-30 Super Hercules with 40 support personnel was deployed on 15 January to Mali. Germany: Three German Air Force Transall C-160 are deployed to the Malian capital Bamako to help with the transport of equipment. On February 28, 2013, the German parliament approved sending up to 330 Geman soldiers to provide engineer mentoring, logistical and medical service to the operation as well as one additional A310 MRTT air-to-air refueling plane. Netherlands: Initially the Dutch government decided to deploy a Royal Netherlands Air Force KDC-10 tanker/transport plane. For its first flight the aircraft picked up its supplies in France and proceeded to N’Djamena in Chad, where the French military have a logistic support hub. After 14 January 2013 the Dutch began to fly directly into Bamako. Later the Dutch contribution was increased by an additional KDC-10 tanker/transport plane, four C-130 Hercules transport planes and one DC-10 passenger plane. Spain: A Spanish Air Force C-130 Hercules with 50 support personnel was deployed on 18 January to Mali to help with the transport of African-led International Support Mission to Mali personnel. Spain later added a C-295 plane to assist in troop movements in Mali. An additional 30 soldiers were sent on February 13 to protect allied instructors. Sweden: The Swedish government allowed France the use of the Swedish share of the NATO Strategic Airlift Capability. Therefore one Heavy Airlift Wing C-17 Globemaster III strategic transport plane was dispatched from the Pápa Air Base in Hungary to France to aid in the transport of materiel and troops to Mali. Also, six Swedish parachute rangers from Fallskärmsjägarna will assist as instructors for Mali´s armed forces. UAE: The United Arab Emirates Air Force deployed two C-17 Globemaster III transport planes to aid in the transport of materiel and troops from France to Mali. UK: The Royal Air Force deployed two C-17 Globemaster III strategic transport planes of No. 99 Squadron from RAF Station Brize Norton to the French Évreux Air Base on 13 January. The planes will transport French armored vehicles to the Malian capital Bamako in what the British are calling Operation Newcombe. On 25 January, the UK Ministry of Defence said it deployed a Sentinel R1 surveillance aircraft to support French forces. The British government announced on 28 January that British troops will deploy to Mali but that they would not be involved in combat. According to the BBC, on 29 January it was understood that 40 British advisers were to operate within Mali, and more in other nations, making a total of 350. There was a debate about whether these advisers should be protected by French forces, or by British troops. The latter would result in a deployment of "multiples of dozens". An urgent question was secured in the House of Commons to allow the MoD to clarify the issue. USA: The US Air Force has established an air bridge between the Istres-Le Tubé Air Base in the South of France and Malian capital Bamako using up to five C-17 Globemaster III transport planes to ferry French equipment and troops to Mali. A small contingent of American troops will provide flight support operations at Bamako. On January 26, The US Defense Secretary Leon Panetta informed French Minister Jean-Yves Le Drian that the "US Africa Command will support the French military by conducting aerial refueling missions as operations in Mali continue,"
The operation began on 11 January 2013 with French Army Gazelle helicopters armed with 20 mm cannons from the 4th Special Forces Helicopter Regiment attacking a rebel column near Sévaré. French forces suffered one casualty when a Gazelle attack helicopter came under small arms fire and one of the two pilots was hit. The pilot, Lt. Damien Boiteux, later died of his injuries. The other pilot managed to fly the helicopter back to base, but the aircraft was written off as lost due to the damage sustained. By 12 January, hundreds of French troops were involved in the military operation in Mali, with special focus in the Battle of Konna. The Malian army claimed that, with their help, it had retaken Konna, which it had lost a few days earlier. French airstrikes appeared to stop the rebel advance to the south which prompted the intervention and destroyed an Ansar Dine command post near Konna. France asked the U.S. to speed up its contribution by sending drones to improve surveillance over the vast area of northern Mali. The Pentagon is reported to be studying the French request. Meanwhile the Prime Minister of the United Kingdom announced that his country would lend logistical support to the operation. ECOWAS troops preparing to deploy to Mali also decided to move up their arrival date to 14 January at the latest. On 13 January, French planes bombed rebels' positions in Gao. Air strikes hit a fuel depot and a customs house being used as a headquarters by the Islamist rebels. Dozens of Islamist fighters were killed. A Malian security source put the number of dead fighters at 60. On 15 January, the French defense minister confirmed that the Mali military had still not recaptured Konna from rebel forces, despite earlier claims that they did. On 15 January, French special forces entered the strategically important central town of Markala, describing it as "secured" on the 19 January. The French and Malian forces launched a major ground offensive into the North of the country for the first time on 16 January. Along with French help, Mali military took back the control of Konna on 18 January. On 21 January the Malian military, with the aid of French air support, took possession of Diabaly. On the next day, Chadian forces began moving from Niger's capital city, Niamey, to Ouallam, a position some one-hundred kilometers south of the Malian border. On 25 January it was reported that a combined force of French and Malian troops captured the town of Hombori, which lies 100 miles south of Gao. French forces also bombed Islamist troops and their supply stores around Gao. This resulted in the destruction of two Islamist bases with fuel stocks and weapon dumps. On the morning 26 January French forces captured the airport at Gao and also seized the main Wabary bridge over the Niger River into Gao. French special forces were also in action against rebels that had melted into the local population. During the next few hours the French-Malian forces assaulted the town of Gao backed by French warplanes and helicopters. The Islamists lost a dozen fighters while the French did not take any any losses or injuries. A Malian army spokesman said on the 27 January that the "Malian army and the French control Gao today". On the 27 January French forces captured Timbuktu without resistance after Islamist fighters fled the city to avoid French airstrikes. In capturing Timbuktu, documents left by AQIM where found revealing the strategic organization of the group. After gaining the airport on 27 January, the next day, Malian and French military sources claimed that the entire area between Gao and Timbuktu was under government control and access to the city was available. On the 19 February a French soldier, member of the French Foreign Legion, was killed during heavy fighting in the Adrar des Ifoghas mountains in the far North East of Mali near the Algerian border. On 3 March a French paratrooper was killed in the same area and the Chadian army announced the killing of the two Islamic Algerian leaders Abdelhamid Abou Zeid and Mokhtar Belmokhtar. This was not confirmed by the French army. However on 5 March the death of Abou Zeid was confirmed by a member of Al-Qaeda in the Islamic Maghreb (AQIM). On 6 March, a French Army sergeant from the 68th African artillery regiment was killed during an operation in eastern Mali around 100 km (60 miles) from the town of Gao, the former stronghold of the Movement for Oneness and Jihad in West Africa (MOJWA). On 17 March a corporal from the 1st Marine Infantry Regiment was killed when his vehicle was hit by an Improvised explosive device in the south of Tessalit in the Adrar des Ifoghas massif. Three other soldiers were wounded by the explosion. On 30 March, the city of Timbuktu was attacked when a suicide bomber blew himself up at a Malian army checkpoint allowing a group of rebels to infiltrate by night. A contingent of around fifty French soldiers supported by French fighter jets were then sent to reinforce the Malian army who couldn't repel the rebel attack. By 1 April, rebel presence in the city was cleared. On 12 April, two suicide bombers detonated their belts, blowing themselves up near a group of Chadian soldiers, in a busy market in Kidal. At least three soldiers were killed in the explosion and a dozen of civilians were wounded. On 11 May 2013 the command of ground operations of in Mali passed from the 3e Brigade Mécanisée to the 6e Brigade Légère Blindée. On 25 May 2013, French forces began their first stage of withdrawal when a convoy of lorries left Bamako for Ivory Coast carrying equipment and vehicles no longer needed. On July 30, a French soldier was killed in a vehicle accident and a second soldier suffered injuries. This death brought to seven the total number of French soldiers killed in support of operations in Mali. In the wake of the French deployment, ECOWAS said that it had ordered its African-led International Support Mission to Mali to be deployed immediately and the European Union said it had increased preparations for sending a military training mission, EUTM Mali. UN secretary general Ban Ki Moon hoped on 12 January that the French government's decision would "be consistent with the spirit" of UN Security Council resolution 2085 adopted in December. Algerian foreign ministry spokesman Amar Belani expressed support for the Malian transitional authorities, and "noted that Mali has asked, in line with its sovereignty, for friendly powers to reinforce its national capacities to fight terrorism". Germany could take part in any European training mission to Mali to help its government prepare troops to counter the insurgents, German Chancellor Angela Merkel said on 14 January. German foreign minister Guido Westerwelle ruled out the possibility of German armed forces taking part in a combat mission in Mali, but he also said Germany was prepared to help train the Mali Armed Forces. On 14 January, the Tuareg separatist MNLA declared it would fight alongside the French and even the Malian government to "end terrorism in Azawad". The spokesman also declared that the MNLA would be a more effective force than those of the neighboring West African nations "because of our knowledge of the ground and the populations". The Franco-German  geographer Christophe Neff stated that without the Operation Serval the Islamic rebellion would have captured Bamako by the end of January 2013. Mathieu Guidère, a scholar of Islam and the Arab world at the University of Toulouse said in an interview published in the newsmagazine Jeune Afrique that without the French military intervention the state of Mali would have fallen. France has said that the reason for the operation is because otherwise it would allow "a terrorist state at the doorstep of France and Europe." An Al Jazeera poll found that 96% of Malians in Bamako supported French intervention. ↑ Daniel, Serge. "Mali's isolated junta seeks help to stop Tuareg juggernaut". Modern Ghana. http://www.modernghana.com/news/386487//malis-isolated-junta-seeks-help-to-stop-tuareg-jug.html. Retrieved 13 January 2013. ↑ 5.0 5.1 5.2 francetvinfo Mali. Qui sont les islamistes à qui la France a déclaré la guerre ? ↑ "French soldier dies in Mali in road accident". July 31, 2013. http://www.france24.com/en/20130731-france-soldier-dies-mali-road-accident. Retrieved July 31, 2013. ↑ 7.0 7.1 "RETEX Mali : les hommes et les matériels ont souffert mais ont tenu". http://defense.blogs.lavoixdunord.fr.+4 October 2013. http://defense.blogs.lavoixdunord.fr/archive/2013/10/04/mali-les-materiels-ont-souffert-mais-ont-tenu-12183.html. Retrieved 15 January 2013. ↑ "Cinco militares mueren en Malí en un accidente de helicóptero". Terra. 12 April 2013. http://noticias.terra.com/internacional/cinco-militares-mueren-en-mali-en-un-accidente-de-helicoptero,b72a56a617efd310VgnCLD2000000ec6eb0aRCRD.html. Retrieved 12 April 2013. ↑ "Chad foreign minister warns against early Mali exit". 7 March 2013. http://articles.chicagotribune.com/2013-03-21/news/sns-rt-us-mali-crisis-chadbre92k0s4-20130321_1_adrar-des-ifoghas-gao-fight-against-islamist-rebels. Retrieved 21 March 2013. ↑ "Mali : retour sur l'opération Serval avec le général Barrera". 1 October 2013. http://defense.blogs.lavoixdunord.fr/archive/2013/10/01/mali-general-barrera-12173.html. ↑ "Torture, beatings, and death for detained Malians". IRIN News. United Nations. 15 April 2013. http://www.irinnews.org/Report/97845/Torture-beatings-and-death-for-detained-Malians. Retrieved 30 April 2013. ↑ "la France a mené une série de raids contre les islamistes" (in fr). Le Monde. 12 January 2013. http://www.lemonde.fr/afrique/article/2013/01/12/la-france-demande-une-acceleration-de-la-mise-en-place-de-la-force-internationale-au-mali_1816033_3212.html. Retrieved 15 January 2013. ↑ Hugh Schofield (12 January 2013). "Mali and France 'push back Islamists'". BBC. http://www.bbc.co.uk/news/world-africa-20991723. Retrieved 15 January 2013. ↑ "Battling Islamists in Mali". The New York Times. 11 January 2013. http://www.nytimes.com/2013/01/12/world/africa/mali-islamist-rebels-france.html?hp&_r=1&.France. Retrieved 15 January 2013. ↑ "Mali Besieged by Fighters Fleeing Libya". Stratfor. http://stratfor.com/weekly/mali-besieged-fighters-fleeing-libya. Retrieved 22 March 2012. ↑ "Tuareg rebels declare the independence of Azawad, north of Mali". Al Arabiya. 6 April 2012. http://english.alarabiya.net/articles/2012/04/06/205763.html. Retrieved 6 April 2012. ↑ Serge Daniel (27 June 2012). "Islamists seize north Mali town, at least 21 dead in clashes". Google News. Archived from the original on 23 November 2012. http://www.webcitation.org/6COAOi3jn. Retrieved 27 June 2012. ↑ Adam Nossiter (18 July 2012). "Jihadists' Fierce Justice Drives Thousands to Flee Mali". Archived from the original on 23 November 2012. http://www.webcitation.org/6COAByjaK. Retrieved 23 November 2012. ↑ "Mali: des islamistes à la lisière Nord-Sud". 1 September 2012. http://www.lefigaro.fr/flash-actu/2012/09/01/97001-20120901FILWWW00429-mali-des-islamistes-a-la-lisiere-nord-sud.php. Retrieved 13 January 2013. ↑ "Ban Ki-moon met en garde contre une intervention au Mali". 29 November 2012. http://www.lemonde.fr/afrique/article/2012/11/29/ban-ki-moon-met-en-garde-contre-une-intervention-au-mali_1797305_3212.html. Retrieved 13 January 2013. ↑ 27.0 27.1 "Mali: lancement de l’opération Serval, Ministère de la Défense" (in fr). Defense. 12 January 2013. http://www.defense.gouv.fr/operations/actualites/mali-lancement-de-l-operation-serval. Retrieved 15 January 2013. ↑ "BBC News - France Rafale jets target Gao in eastern Mali". BBC. 13 January 2013. http://www.bbc.co.uk/news/world-europe-21002918. Retrieved 15 January 2013. ↑ "Mali: La France lance ses Rafale et Tigre dans la bataille" (in fr). Mer et Marine. 14 January 2013. http://www.meretmarine.com/fr/content/mali-la-france-lance-ses-rafale-et-tigre-dans-la-bataille. Retrieved 15 January 2013. ↑ "Mali: la France veut " accélérer " l'opération militaire". Lesechos. 13 January 2013. http://www.lesechos.fr/economie-politique/monde/actu/0202495643689-multiples-raids-aeriens-francais-contre-les-islamistes-au-mali-527953.php. Retrieved 15 January 2013. ↑ "Opération Serval: montée en puissance du dispositif et poursuite des opérations" (in fr). Defense. 15 January 2013. http://www.defense.gouv.fr/operations/mali/actualite/operation-serval-montee-en-puissance-du-dispositif-et-poursuite-des-operations. Retrieved 13 January 2013. ↑ "Serval: rearticulation du dispositif" (in French). French Army - Armée de Terre. 20 May 2013. http://www.defense.gouv.fr/operations/mali/actualite/serval-rearticulation-du-dispositif. Retrieved 23 May 2013. ↑ "Belgien stellt zwei Flugzeuge und einen Hubschrauber für Mali" (in de). Europe Online. 20 November 2012. http://www.europeonline-magazine.eu/belgien-stellt-zwei-flugzeuge-und-einen-hubschrauber-fuer-mali_258627.html. Retrieved 15 January 2013. ↑ "Canada sends C-17 to Mali". Castanet. 14 January 2013. http://www.castanet.net/news/Canada/85848/Canada-sends-C-17-to-Mali. Retrieved 15 January 2013. ↑ "France wants Canada's C-17 missions to Mali extended". CBC News. 17 January 2013. http://www.cbc.ca/news/politics/story/2013/01/17/pol-canada-mali-thursday.html. Retrieved 18 January 2013. ↑ "Air Force cargo plane heading to Mali". The Copenhagen Post. 15 January 2013. http://cphpost.dk/news/international/air-force-cargo-plane-heading-mali. Retrieved 15 January 2013. ↑ "Spain offers to France a plane to move African troops". El País. 17 January 2013. http://politica.elpais.com/politica/2013/01/16/actualidad/1358339112_957357.html. Retrieved 18 January 2013. ↑ "Spain sends 30 soldiers to Mali to protect European instructors". El País. 13 February. http://politica.elpais.com/politica/2013/02/13/actualidad/1360772714_134583.html?rel=rosEP. ↑ "RAF C17 cargo plane to help French operation". BBC. http://www.bbc.co.uk/news/uk-21004040. Retrieved 15 January 2013. ↑ "Mali: RAF surveillance aircraft Sentinel deployed". BBC. http://www.bbc.co.uk/news/uk-21200718. Retrieved 25 January 2013. ↑ Chris Carroll (22 January 2013). "Pentagon: US Air Force flying French troops, equipment to Mali". http://www.stripes.com/news/africa/pentagon-us-air-force-flying-french-troops-equipment-to-mali-1.204831. Retrieved 26 January 2013. ↑ Andrew Tilghman (22 January 2013). "U.S. C-17s helping supply French ops in Mali". http://www.armytimes.com/mobile/news/2013/01/military-mali-air-operations-france-012213w. Retrieved 22 January 2013. ↑ Par Nathalie Guibert. "Mali: après la mort rapide d'un officier, l'opération militaire s'annonce compliquée" (in French). Le Monde.fr. http://www.lemonde.fr/afrique/article/2013/01/12/mali-apres-la-mort-rapide-d-un-officier-l-operation-militaire-s-annonce-tres-dure_1816237_3212.html. Retrieved 13 January 2013. ↑ Merchet, Jean-Dominique. "Mali: le premier mort français de l'opération Serval" (in French). Marianne.net. http://www.marianne.net/blogsecretdefense/Mali-le-premier-mort-francais-de-l-operation-Serval_a912.html. Retrieved 13 January 2013. ↑ "French troops continue operation against Mali Islamists". BBC. 2013-01-12. http://www.bbc.co.uk/news/world-africa-20997522. Retrieved 2013-01-15. ↑ Vasudevan Sridharan (12 January 2012). "France's Airstrike Helps Mali Army to Recapture Konna". http://www.ibtimes.co.uk/articles/423409/20130112/mali-konna-capture-islamist-rebels-france-airstrike.htm. ↑ Robyn Dixon (12 January 2013). "France airstrikes in Mali repel Al Qaeda-linked militants". http://www.latimes.com/news/nationworld/world/la-fg-france-mali-fighting-20130113,0,4363315.story. Retrieved 12 January 2013. ↑ "UK troops to assist Mali operation to halt rebel advance". 12 January 2013. http://www.bbc.co.uk/news/uk-20999533. Retrieved 13 January 2013. ↑ "France surprised by Mali Islamists' fighting strength". http://www.bbc.co.uk/news/world-europe-21002918. ↑ "Mali Islamists counter attack, threaten France WORLD". Ibnlive.in.com. 2013-01-15. http://ibnlive.in.com/news/mali-islamists-counter-attack-threaten-france/315763-2.html. Retrieved 2013-01-15. ↑ Afua Hirsch in Bamako and Kim Willsher in Paris (2013-01-14). "Mali conflict: France has opened gates of hell, say rebels". Guardian. http://www.guardian.co.uk/world/2013/jan/14/mali-conflict-france-gates-hell. Retrieved 2013-01-15. ↑ "Malian troops take key town;humanitarian crisis grows". CNN. 21 January 2013. http://www.cnn.com/2013/01/21/world/africa/mali-unrest/index.html. Retrieved 22 January 2013. ↑ "Mali crisis: Troops 'take northern town of Hombori'". BBC. 25 January 2013. http://www.bbc.co.uk/news/world-africa-21203731. Retrieved 25 January 2013. ↑ Rukmini Callimachi (14 February 2013). "In Timbuktu, al-Qaida left behind a manifesto". http://www.armytimes.com/mobile/news/2013/02/ap-timbuktu-al-qaida-left-behind-manifesto-021413. Retrieved 18 February 2013. ↑ "French troops in Mali take Kidal, last Islamist holdout". BBC. 31 January 2013. http://www.bbc.co.uk/news/world-africa-21272125. Retrieved 31 January 2013. ↑ "French clash with Islamists in north Mali". The Telegraph. 6 February 2013. http://www.telegraph.co.uk/news/worldnews/africaandindianocean/mali/9851936/French-clash-with-Islamists-in-north-Mali.html. Retrieved 8 February 2013. ↑ David Lewis (10 February 2013). "Gunbattle rocks Gao after rebels surprise French, Malians". http://www.reuters.com/article/2013/02/10/us-mali-rebels-idUSBRE91902V20130210. Retrieved 18 February 2013. ↑ Bamako (17 February 2013). "French, Malian troops secure rebel strongpoint near Gao". http://www.reuters.com/article/2013/02/17/us-mali-rebels-bourem-idUSBRE91G0CO20130217. Retrieved 18 February 2013. ↑ "Al Qaeda leader Abou Zeid 'killed in Mali'". 5 March 2013. http://www.france24.com/en/20130304-al-qaeda-confirms-abou-zeid-death-mali-0. Retrieved 5 March 2013. ↑ "Relève de la 3e brigade mécanisée par la 6e brigade légère blindée" (in French). French Ministry of Defense. http://www.defense.gouv.fr/operations/mali/actualite/serval-releve-de-la-3e-brigade-mecanisee-par-la-6e-brigade-legere-blindee. Retrieved 15 May 2013. ↑ "France begins first stage of Mali military withdrawal". BBC. http://www.bbc.co.uk/news/world-africa-22664484. Retrieved 25 May 2013. ↑ "France confirms Mali military intervention". BBC News. 11 January 2013. http://www.bbc.co.uk/news/world-africa-20991719. Retrieved 12 January 2013. ↑ "Mali air strikes: 'The situation has become much more volatile,' says Ban Ki-moon". http://www.telegraph.co.uk/news/worldnews/africaandindianocean/mali/9797482/Mali-air-strikes-The-situation-has-become-much-more-volatile-says-Ban-Ki-moon.html. ↑ "Mali PM arrives in Algiers after pledge of support". http://www.chinapost.com.tw/international/africa/2013/01/14/367292/Mali-PM.htm. ↑ "Germany could assist in Mali training mission: Merkel". Reuters.com. 2012-10-22. http://www.reuters.com/article/2012/10/22/us-germany-mali-idUSBRE89L1LU20121022. Retrieved 2013-01-15. ↑ "Mali conflict: France has opened gates of hell, say rebels". http://www.guardian.co.uk/world/2013/jan/14/mali-conflict-france-gates-hell. ↑ "Blognotice 22.01.2013: pensées personnelles franco-allemandes sur le cinquantième anniversaire du Traité de l’Elysée". http://cneffpaysages.blog.lemonde.fr/2013/01/22/blognotice-22-01-2013-pensees-personnels-franco-allemands-sur-le-cinquantieme-anniversaire-du-traite-de-lelysee/. ↑ "Sur les débuts de l’Opération Serval". http://cneffpaysages.blog.lemonde.fr/2013/01/14/blognotice-14-01-2012-sur-les-debuts-de-loperation-serval/. ↑ "Mathieu Guidère : "Sans l'intervention française, l'État malien tombait"". http://www.jeuneafrique.com/Article/JA2714p047.xml0/algerie-france-maroc-libyemathieu-guidere-sans-l-intervention-francaise-l-tat-malien-tombait.html. ↑ "Francia le expresó a Santos apoyo frente al proceso de paz en Colombia". http://www.eltiempo.com/politica/francia-apoyaria-proceso-de-paz-en-colombia_12552383-4.